Coverage: Live on BBC TV, BBC Red Button, BBC Sport app, Connected TVs and online. Ronnie O'Sullivan must match Stephen Hendry's World Championship title haul to be considered snooker's greatest player, according to reigning world champion Stuart Bingham. Hendry, who retired in 2012, has seven Crucible titles to his name, while O'Sullivan has won snooker's showpiece event on five occasions. 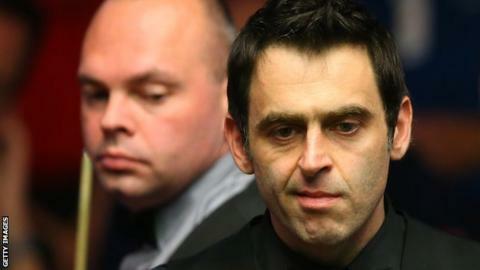 "Ronnie is the best player to ever pick up a cue," Bingham, 39, told BBC Sport. "But to be the greatest player you have to beat the records." O'Sullivan, 40, is looking to go within one world title of the Scot, who won a total of 36 ranking titles, when this year's event gets under way on Saturday. Bingham added: "Hendry was a born winner; he only loved winning and he was more ruthless than anyone. Ronnie is the most talented and the best in the world, but to be the greatest ever you need titles." Bingham beat O'Sullivan on his way to lifting snooker's biggest prize in Sheffield for the first time last year and he is in no doubt that the unpredictable talents of the 28-time ranking event winner make him the man to beat once again. "He is the only person in the game who has the aura that Stephen Hendry and Steve Davis had," Bingham added. "Whatever tournament he enters, he is probably going to be favourite - and rightly so. He is the best player in the world." Bingham said the game's best players were capable of toppling O'Sullivan, but it was also a matter of believing it, and lasting the distance at the 17-day tournament. "Anyone now in the top 16 will fancy their chances," the Basildon-born potter said. "But, when it comes down to the crunch, to actually beat Ronnie, it's a different ball game. "I remember saying to Ronnie last year: 'How have you won it five times?' I won it last year and it took me three weeks to get over it. "How he has done it five times I will never know. It just shows you what a class act he is."